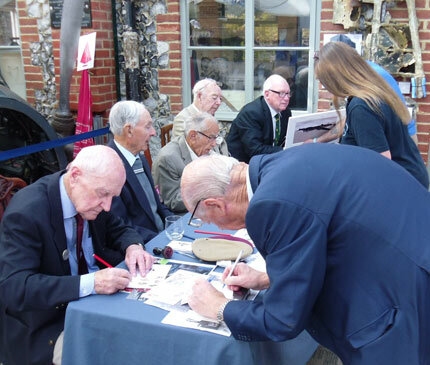 The Museum was privileged to welcome a group of veterans on Sunday 4th October 2015 who included ‘Jock’ Hutton of the Parachute Regiment – he was one of the first into action on D-Day and he subsequently saw action during the Battle of The Bulge, the Crossing of The Rhine (Operation Varsity) and the continued advance into Germany. 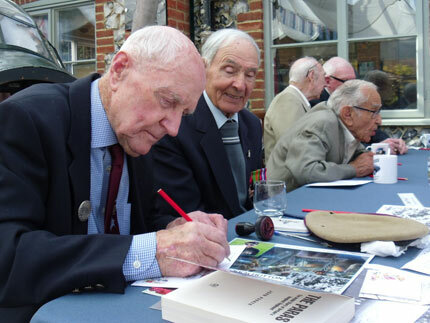 Joining him at the table were ‘Bomber Boys’ John Waye, Ted Molyneux, Sid Beaver DFM and Harry Irons DFC. In very fine weather a great day was had by all, so thank you to everyone who came along to support the event and the monies raised were shared equally between the Bomber Command Memorial Maintenance Fund and on-going Museum projects. 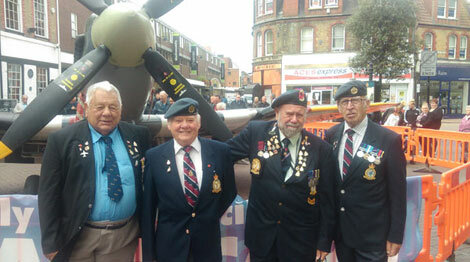 Dartford Council Leader Jeremy Kite really pushed the boat out to commemorate the 75th anniversary of the Battle of Britain, arranging for a Spitfire to be present outside The Victoria and Bull Hotel. It was very reminiscent of the Spitfire Funds of 1940. The museum had a stand next to the Spitfire, and a great day was had by all. Photo shows club member Roy Monk and friends! You are currently browsing the Shoreham Aircraft Museum – News archives for October, 2015.